As you interact with your managers on a daily basis, their behaviors will often tell you a great deal more than their words. 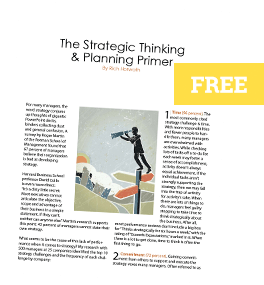 We’ve all been in meetings where a person uses the word “strategic” to preface the majority of their comments: “strategic priorities, strategic objectives, strategic metrics, strategic napkins”–you get the picture. But, how often are they really being strategic? “The path to recovery lies first and foremost in returning to sound management practices and rigorous strategic thinking,” offers business author Jim Collins. We know when we’re getting beat. We know when our excuses outnumber our strategies. We know when we’re not reaching our full potential. We know, but what’s more telling, is how we behave.